Bernard-Soulier syndrome also called hemorrhagiparous trombocytic dystrophy,is a arare autosomal recessive coagulopathy (bleeding disorder, this means that both parents must carry a gene for the Bernard-Soulier syndrome and transmit that gene to the child to have the desease) that causes a deficiency of Glicoprotein lb. Gplb, also known as CD42, is a component of the GPIb-V-IX complex on platelets. 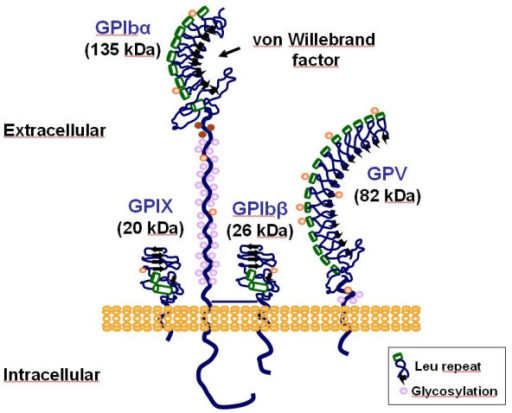 The GPIb-V-IX complex binds von Willebrand factor, allowing platelet adhesion and platelet plug formation at sites of vascular injury. A gain-of-function mutation causes Von Willebrand's desease. Autoantibodies against Ib/IX can be produced in Immune throembocytopenic purpura. Components include GP1BA and GP1BB. It complexes with Glicoprotein IX, , the receptor for von Willebrand factor, which is important in clot formation. Blood clotting is a complex process that stops blood from leaking through holes in damaged blood vessel walls. When a blood vessel is injured, it automatically constricts to reduce the blood flow to the damaged area. Normally, small cells circulating in the blood called platelets stick to the damaged vessel wall. The platelet plug is subsequently strengthened with a protein called fibrin. Normal platelets circulate in the blood and are the primary cells responsible for initiating clotting. Without this receptor, platelets cannot stick together and clotting does not occur normally. The parents of a child with Bernard-Soulier syndrome will have a decrease in the glycoprotein but no impairment of platelets function and no abnormal bleeding. The Bernard-Soulier gene has been mapped to the short (p) arm of chromosome 17 (in the region 17pter-17p2). It was first described in 1948 (by two French hemathologists named Jean Bernard and Jean-Pierre Soulier, who were treating a young boy who had been suffering abnormal bleeding episodes from birth and whose older sister had hemorrhaged to death) as a congenital bleeding disorder and the incidence is estimated to be less than 1 in 1 million persons, based on cases reported from Europe, North America, and Japan (prevalence is probably higher due to misdiagnosis and under reporting). This low frequency could probably be explained by the fact that the affected genes are very compact being interrupted by only 1 or 2 introns. The severity of bleeding tendency changes according to an injury or surgery. The first case was described in whites of European ancestry, as well as in the Japanese population. Male and female are affected with the same frequency. Bleeding may begin in infancy and may continue throughout life. For a woman, the problems associated with Bernard-Soulier syndrome diminish with time, through different stages of life – notably, childhood, puberty and the childbearing years. Bernard–Soulier syndrome usually presents in the newborn period, infancy or early childhood. Abnormally prolonged bleeding from small injuries (for example, stomach ulcers). Characterized by prolonged bleeding time (from 5-10 minutes to 20 minutes), thrombocytopenia (it cause is not definitely known, but it is probably related to a decreased platelets life span), increased megakaryocytes (bone marrow platelet progenitors), and decreased platelet survival, Bernard–Soulier syndrome is associated with quantitative or qualitative defects of the platelet glycopotein complex GPIb/V/IX. The degree of thrombocytopenia may be estimated incorrectly, due to the possibility that when the platelet count is performed with automatic counters, giant platelets (which may be as frequent as 70–80% in occasional patients) may reach the size of red blood cells and, as a consequence, are not recognized as platelets by the counters. BSS platelets do not aggregate to ristocetin (an antibiotic that normally causes platelets to aggregate), and this defect is not corrected by the addition of normal plasma, distinguishing it from von Willebrand disease. The platelet responses to physiologic agonists is normal, with the exception of low concentrations of thrombin. Bleeding events, which may be very severe, can be controlled by platelet transfusion. Most heterozygotes, with few exceptions, do not have a bleeding diathesis. How is Bernard-Soulier syndrome diagosed? Patients are diagnosed after seeking medical attention following prolonged or reoccurring bleeding episodes. Some infants are diagnosed after excessive bleeding following circumcision. Other may be diagnosed after bleeding excessively following trauma , tooth extraction or surgery such as tonsillectomy, appendectomy, splenectomy. Bleeding mainly affects mucocutaneous tissues, and major hematomas are very rarely observed. Genetic counseling should follow the standards established for all autosomal recessive deseases. Prenatal diagnosis is theoretically feasible when the genetic defect has been identified in a particular kindred. This is probably not justified as the syndrome rarely gives rise to life threatening bleeding. With a good prophylaxis, a fairly normal quality of life can be maintained. In addition, cord blood or chorion villus sampling bear a high risk of bleeding and premature abortion. CBC count: Giants platelets are seen ona peripheral smear, possibly exceeding the size of a RBC. Bleeding time: It is usually prolonged. The template bleeding time has largely been replaced by automatic platelet function analyzers (PFA), such as PFA-100. Platelet aggregation studies: They don’t aggregate in response to ristocetin. This is not corrected by the addition of normal plasma, as seen in von Willebrand disease. Platelets have normal aggregation in response to adenosine diphosphate (ADP), epinephrine and collagen. Flow cytometry: Flow cytometry can demonstrate abnormalities of platelet membrane glycoprotein. Care of Bernard-Soulier syndrome (BSS) is generally supportive. Avoid antiplatelet medication, such as aspirin. For surgery or life-threatening hemorrhage, platelet transfusion is the only available therapy. Platelet transfusions should be reserved for surgery or potentially life-threatening bleeding. The patient may develop antiplatelet antibodies because of glycoproteins Ib/IX/V, which are present on the transfused platelets but absent from the patient's own platelets. These agents are used to enhance hemostasis when fibrinolysis contributes to bleeding. Inhibits fibrinolysis via inhibition of plasminogen activator substances and, to a lesser degree, through antiplasmin activity. The main problems are that the thrombi that form during treatment are not lysed and effectiveness is uncertain. Alternative to aminocaproic acid. Inhibits fibrinolysis by inhibiting plasminogen activators. Desmopressin stimulates factor VIII, prostaglandins, and plasminogen release, but the mechanism of action is not clear and may not be common to all 3 substances. These agents possess effect on vessel walls that produces an increase in platelet adhesion. This local hemostatic action may account for its hemostatic properties. Used to decrease bleeding time in some, but not all, patients with BSS. It may be useful for minor bleeding episodes. The exact mechanism for this is unknown, but it may relate to increased levels of vWF binding to some residual glycoprotein Ib in patients without an absolute deficiency. Hemostasis is the physiological response to bleeding. Injury and factors released by platelets initiates the coagulation cascade, which is mediated by blood clotting factors. This results in formation of an insoluble fibrin clot, thus reinforcing the initial platelet plug. Clotting factors (ie, antihemophilic factor [factor VIII], factor VII, or IX) function as cofactors in the blood coagulation cascade. Vitamin K-dependent glycoprotein indicated for the treatment of bleeding episodes in patients with hemophilia A or B and inhibitors. Promotes hemostasis by activating the extrinsic pathway of the coagulation cascade, forming complexes with tissue factor, and promoting activation of factor X to factor Xa, FIX to factor IXa, and factor II to factor IIa. Experience with the use of recombinant activated factor VII is limited in patients with congenital platelet disorders. Safety and efficacy are still are being evaluated. rest and raise the affected limb. the administration of recombinant factor VIIa (Niastase), although scientists do not fully understand how this product works in this specific platelet disorder. always wear a Medic Alert bracelet or necklace that will notify healthcare professionals of Bernard-Soulier syndrome condition in an emergency situation. The tendency to bleed is lifelong in patients with Bernard-Soulier syndrome (BSS) but may somewhat diminish with age. Is very important to educate patients about the disease and the need to avoid trauma and also emphasize good dental hygiene. Currently there is no cure for Bernard-Soulier syndrome; however researchers are studying the efficacy of bone-marrow transplantation and have had some success in treating the syndrome in several severely affected patients. After a year: several menometrorrhagia → diagnostic suspicion of Bernard-Soulier syndrome. Structural examination shows ultrastructural morphological abnormalities like giant platelets, abnormal microtubules. Final diagnosis: Bernard-Soulier syndrome. After a mucous hemorragic syndrome for a couple of years, actually she has only a more abundant menstrual cycle, without suffering from anemia such that require transfusions.